On a flawless day in mid-July on the Oregon coast, the sun shines white. The waist-high grass ripples in the breeze, giving it a silvery velvet shimmer, and the birdsong is excited and active. Three men in waders and canvas hats traverse through a spongy salt marsh, the mud thick and black, rushing to fill the holes after each man’s step with an audible gulp. From a distance, the three appear ready for a day of fishing—if the fishing required a 10-foot-tall tripod, a crank, and bread knives. This stretch of estuary near Coos Bay was once farmland, diked and drained before the turn of the 20th century. 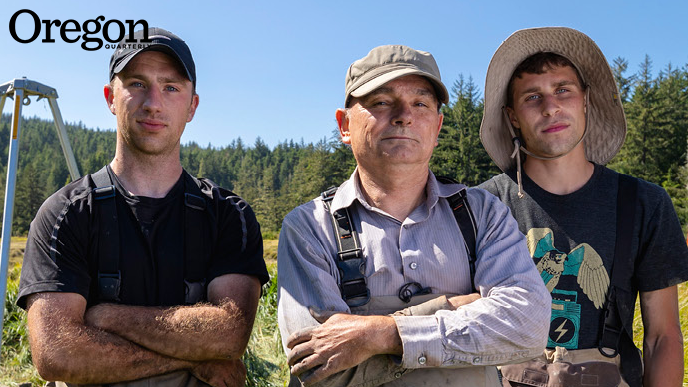 In 1996, the South Slough National Estuarine Research Reserve began restoring it, and that is why the men are here with their tripod, knives, and a cooler. One of them suddenly slaps his own arm once in response to an insect bite, then again. And again. They’re after gas. Nitrous oxide, carbon dioxide, methane, all greenhouse gases that the estuary is constantly producing and releasing into the atmosphere. Yet, at the same time, the estuary also has organisms within it that metabolize greenhouse gases in the air, fixing them in organic materials and removing them from the atmosphere. It’s a rate of exchange, and with their research, the three men marching through the muck will likely inform future public policy and plans for land use. Biology professor Scott Bridgham and Matthew Schultz, a graduate student in his lab, have been studying the rate of exchange in Pacific Northwest estuaries for years. The third man, the one slapping his arm, is senior Emil Sadofsky, who is spending his last summer of college under a glorious blue sky, in mud up to his knees, hauling coolers and heavy tripods around a salt marsh. He, along with Schultz, is one of the recipients of the Peter O’Day Fellowship, which is funding this research and this trek into the salt marsh. For Sadofsky, despite the insects, mud, and the perspiration, there is no better place to be. The anonymous alumni donor was explicit: The fellowship was to fund biological undergraduate research, and more specifically, an undergraduate and graduate student mentorship. Now in its second year, the fellowship is named for retired biology professor Peter O’Day, in recognition of his vast contributions to undergraduate research at the University of Oregon. The criteria to qualify for the fellowship is simple: The research must be based in biological sciences, the undergrad must have completed a specific biology class with a B grade or better, and have a 3.00 GPA. “The students can come from any major as long as the research focuses on the biological sciences,” Reasoner says. 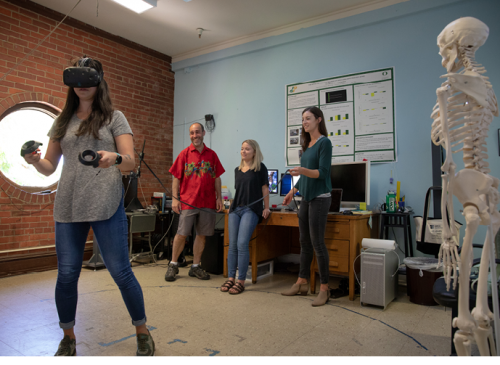 Earlier this summer, four pairs of students were awarded the fellowship, granting them $5,000 per student, a 10-week window to conduct research, and access to UO laboratories, equipment, and facilities. There are many educational experiences that improve academic achievement, graduation rates, and a sense of belonging and identity in the university, Reasoner says. With a serrated bread knife, Sadofsky slices sections of the core samples he, Schultz, and Bridgham have pulled from the earth. It is not easy work. Fueled by elbow grease at the crank, the “punch,” about four inches in circumference, has to slice through four feet of compacted grasses, organic matter, and dense mud. It emerges as a solid, almost the consistency of clay. After Sadofsky slices it into equal increments, he bags the samples and puts them on ice in a cooler. In the restoration of the estuary, the National Estuarine Research Reserve used soil from the dikes to create four quadrants of different heights. The team tests core samples from each quadrant with radioisotope dating. 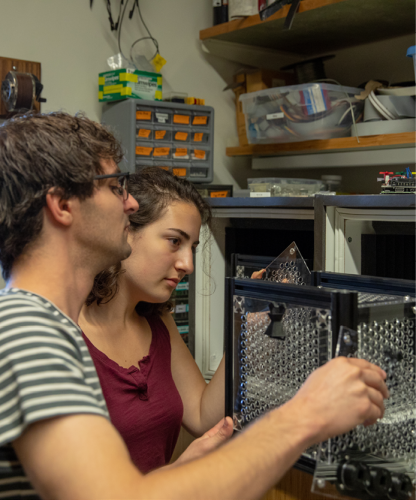 “In this process, the samples are incinerated, and the mass lost in incineration will give the carbon content of the samples,” says Sadofsky, a double major in biology and English. From there, the team can determine how fast carbon accumulated at different time periods and in different sections, and which height was the most effective. That will provide valuable data on the amount of greenhouse gases the estuaries are cleaning out of the atmosphere; in general, estuaries remove more greenhouse gases from the atmosphere than they produce. Under the O’Day Fellowship, the research team presents a specific project, states expected results, and explains how the project could contribute to an academic discipline. In other words, the two student researchers are in charge. And they’re accountable. “The students are doing real, impactful research that may lead to publication, and that’s pretty huge for an undergrad,” Reasoner says. In the warren of human physiology offices and laboratories in Esslinger Hall, senior Chaucie Edwards and graduate student Matt Ely’s lab looks part emergency room, part hobby bench. Behind a stretcher with a pristine white pillow on top, the space is organized and tidy with sensors stored in test tubes, their wires twisted precisely as to not become knotted. Edwards and Ely have assembled what looks like the seat from a weightlifting bench bookended by thick yellow bricks of upholstery foam. Professor John Halliwill, principal investigator for the project, designed the apparatus. It’s a knee extender; the subject raises their leg up and down for an hour to the measured tick, tick, tick of a metronome, which keeps the rhythm paced and the subject on track for the duration. Edwards and Ely are studying histamine—a compound released by cells in response to injury and in allergic and inflammatory reactions. They want to learn why histamine is released in the muscle during exercise and if it may be related to the widening of capillaries, similar to inflammation in allergies—which seems daunting until Edwards explains it. Subjects are fitted with a blood-pressure cuff around the thigh, which prevents the blood from leaving the leg after the hour of exertion. Sensors are also attached to the thigh, connected by tiny wires filled with mercury, which conducts electricity. This system feeds data into an ergometer, which presents the results across a computer screen in a pattern resembling a heart rate but is a measure of fluid leaving the circulation, traveling through the capillaries and into the muscle. Edwards, a Robert D. Clark Honors College student, began working in Halliwill’s lab as a volunteer and spent the last year helping with other projects and being trained on procedure and equipment. As a human physiology major, she was fascinated by the subject of capillary permeability and the fact that very few studies existed on it. The research project also fit the requirements for her honor’s thesis, which will be completed before she graduates. This data will help Edwards and Ely answer the question of what the histamine is doing: Is it holding the capillaries open for increased blood flow? Is histamine helping to regulate blood pressure? That’s quite an honors thesis for Edwards. What if there was a way to turn back the biological clock to the early years of childhood, when learning potential is at its maximum, due to the flexibility of brain cells? What would that mean for Alzheimer’s and dementia patients? That’s what prompted graduate student Jonathan Saunders to run a pilot study in principal investigator Michael Wehr’s neuroscience lab. He wanted to find out if the perineuronal nets—molecular structures that surround some neurons—when dissolved, could return the cells to a stage called “synaptic plasticity,” when cells are at their fullest capacity for learning language and developing memory. Saunders wanted to see whether “digesting” the neural nets in a mouse had any effect on its ability to learn speech sounds. He reached out to undergrad Brynna Paros, who was also working in the same lab, when they learned about the O’Day Fellowship from Wehr. Paros, a double major in psychology and music, is a flutist whose summer was already packed with master classes at music academies on both coasts. But she also wanted to do a research project involving sound. For Saunders, the implications of this study are nothing short of beautiful. “I think the idea that the brain might store information over the long-term by simply having holes poked in an extracellular protein net is beautiful in its parsimony and hilarious in its duct-tape-and-super-glue-style effectiveness,” he says. As far-reaching as the benefits of the study may be, there was also a personal reward from the O’Day Fellowship—an essential mentoring experience. On the third floor of Gerlinger Hall, the commands are issued by a monotone female voice, spilling into the empty darkened hallways right outside of principal investigator Andrew Karduna’s human physiology lab. The voice is disembodied, emanating from a desktop computer that holds another universe within it. It is a virtual-reality world that only appears within goggles that resemble military-issue, night-vision headgear, and is seen as a black-and-white domed grid. Kieley Trempy, an undergraduate, and Kate Spitzley, her graduate student mentor, are researching the role of handedness in visual proprioception abilities. Vision enables us to see where our body is in space, while proprioception enables us to feel where our body is in space. Our use of both vision and proprioception is essential for healthy movement, and when either is impaired it can lead to disordered movement patterns. Trempy and Spitzley’s study is investigating how handedness influences the relative contributions of vision and proprioception to movement—or our visual proprioceptive abilities, as they are sometimes called. “Visual cues are important for Parkinson’s patients, because their ability to sense where they are in space is reduced,” Trempy adds. The goggles are part of a virtual-reality gaming system that Spitzley and Trempy have programmed and validated to record data, bypassing the expensive laboratory-grade software typically used in such research. It took Spitzley two years to write the code that measures how people move in space while collecting kinematic data—that is, data that describes how the body is moving. Now they are applying what has been learned through preliminary research to test hypotheses on handedness, and theirs is one of the only studies on the subject. “The point of this study is to understand this sensory pathway more in order to apply it to a bigger context, such as those disorders,” Trempy says. Through the virtual-reality goggles, the subject sees a representation of their hand as they hold the controller. The program instructs the subject to reach a specified angle while watching their hand representation, then to relax. This process is repeated, but without an auditory cue from the program, showing the contribution of vision in the movement. Then the subject must replicate the angle without the auditory cue or representation of the hand. This is where proprioception comes into play: Because the subject cannot see their hand, they will move the controller to where they felt the angle was, exhibiting proprioception. “Their arm might actually be at a different angle than what it is in the real world,” Trempy says. “That creates a baseline measurement. She hopes to work with the Parkinson’s population in the future, especially since the O’Day Fellowship has provided the opportunity to explore new research options.